According to Twitter's trending topics, Donald Trump won Monday night's presidential debate against rival Hillary Clinton. #TrumpWon was the number-one trending topic on Twitter midday on Tuesday, which might give you the horrifying impression that people actually believe Trump won the debate. But don't worry — while there are definitely some people who think Trump was the winner, just as many were using the hashtag to counter that idea with sarcasm and some well-placed GIFs. As funny (both funny haha and funny ridiculous) as the tweets are, they are a serious sign of how much work needs to be done before the election. Even though #TrumpWon was used ironically about as often as it was sincerely, the Twitter trend actually points out an interesting fact about the debate. 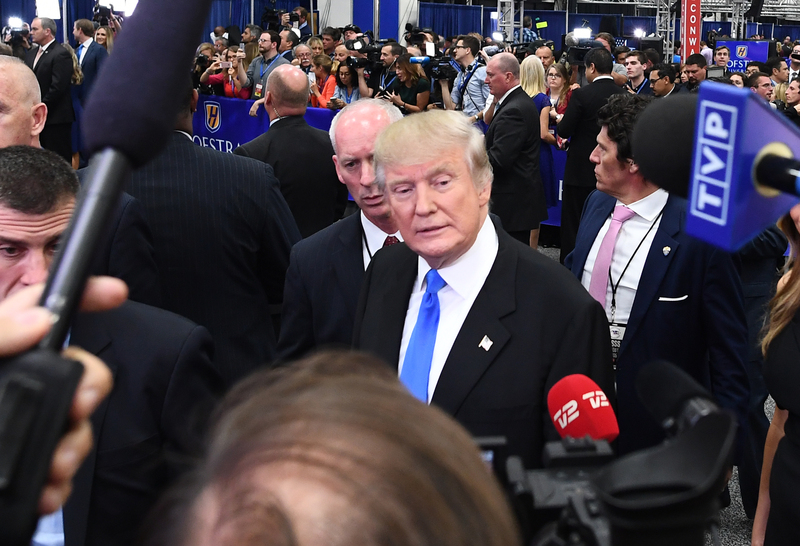 According to many of the online polls on the major news websites, Trump did win the debate — Time, CNBC, and Heavy.com users all picked Trump as the winner, and those sites aren't particularly conservative-oriented. The validity of these polls is less than scientific, but it should still be pretty concerning to Clinton supporters that he won on those websites at all. Those polls show that there's still work to be done if you want to ensure a Clinton victory in November, and there are a lot of minds to change and educate against Trump's racist, sexist rhetoric. If you're using the hashtag to disparage Trump, be careful, because he will still use that as evidence that people think he's the winner. "The #1 trend on Twitter right now is #TrumpWon - thank you!" Trump tweeted Tuesday morning. Without the context, of course, he's right, and it does look like there are just a ton of people who actually believe he won the debate. It's really not that big a deal, and if that's all he has to hang his hat on after the debate, one tweet isn't going to matter. However, should you not want to even inadvertently support Trump, the use of a different hashtag might be warranted. The hashtag is a reminder to be conscientious with media consumption in the weeks leading up to the election. As much as social media doesn't matter in the grand scheme of the election, it also kinda does, and you'll want to be careful about the message behind your message. #TrumpWon is largely satirical, but it's already shown that it has the potential to backfire, and similar scenarios should be avoided until after November 8.